The description of the scheme and operation of the hydraulic system and control drives is given in the paper. The difference of the requirements to hydraulic system and drives is shown concerning specific features of the orbiter flight as compared to standard airplanes. Their structure and principles of operation are described. Servo drives with throttle control are used for aerodynamic rudder surfaces control on the Orbiter, and the hydraulic system is applied to supply these drives with hydraulic energy. The hydraulic system and drives work both at launch of the Orbiter into orbit and at its descent and landing. At the ascent leg of flight, the hydraulic system and drives work in a standby mode providing the capability of Orbiter’s control in the case of emergency descent at occurrence of abnormal situations. The difference of the Orbiter’s aerodynamic layout from the standard airplanes, besides the conventional controls (elevons and rudder), is the availability of a balance flap (BF) and air brake (AB). The air brake of the BURAN Orbiter is structurally made as a split direction rudder and has a common drive with it (rudder-air brake drive). One of essential features of the BURAN Orbiter is the very high requirements are made to the control accuracy of its motion. As result, the main requirement to the hydraulic system and drives is to ensure the steadiness of the hinge moment overcome by drives on the aerodynamic controls at any possible failures. The decrease of the preset drives’ rate is allowable only. The requirement of reliability dictates the necessity of maintenance of serviceability at any two failures in the systems. The hydraulic system and drives should work both in conditions of vacuum and low temperatures at orbit, and at the increased temperatures occurring at descent. Selection of hydraulic system scheme and drives is one of the first problems to be solved at their development. The basis of structure development is the selection of a number of independent channels of hydraulic system, number of chambers (channels) of drives (multi-chamber or single-chamber) and determination of logic of connection between the hydraulic system channels and drives chambers. Minimum systems masses and the required reliability and safety level must be provided. At selection of a hydraulic system and drives structure, the schemes of heavy airplanes were considered as the prototypes. The greatest distribution among them The four-channel hydraulic system (HS) with four-chamber drives of aerodynamic controls, in which each chamber of the drive was fed from its channel of HS are widespread in these planes. In case of two HS-channels failure, two of four drives chambers do not work and, therefore, available hinge moment developed by them is half-maximum. Such reduction is permissible for an ordinary airplane, as the airplane can transfer to another flying mode, where the smaller available hinge moment on rudders is needed. The similar scheme was developed, manufactured and tested on the TU-144 airplane. However, proceeding from the requirements to drives of the Orbiter, the reduction of the available hinge moment is intolerable. Therefore, in order to use the four-channel structure it is necessary to apply the drives and consequently the hydraulic system of a double power that would result in considerable mass increase. After the comprehensive analysis of different versions, the scheme of drive with a single-chamber cylinder and a hydraulic system channels switch was offered. Application of such a drive provides constancy of the available hinge moment at any number of operating channels of the hydraulic system. The drives mass is minimal. Selection of this scheme of drives has demanded the development of a reliable switch for several (not less than three) HS channels. It is intended for large flow rate of operating fluid with very small flows-over between the channels both at operating hydraulic system and in orbit in a stand-by mode. The hydraulic system switch is the major unit of the drive, on which failure-free operation the activity of the whole structure depends. Therefore, the attention was focused on the working out and operational development of this element. Another problem was to ensure the high reliability of the drive excluding its depressurization behind the switch. Large number of design and experimental works solved these problems. The second problem of structure synthesis was the selection of hydraulic system channels number. The structure of hydraulic system is determined by redundancy level of its elements, which in turn depends on the requirements of safety of Orbiter flight. Since the system should be double-failure operational, the number of channels should be not less than three. The comparison of the characteristics of three and four-channel versions of hydraulic systems in their setting power was conducted. In the four-channel hydraulic system, the normal operation of drives should be provided at failure of two channels. Therefore, the setting power of the four-channel HS should be 200% of the nominal. Accordingly, three-channel HS designed for two failures the setting power should be 300% of the nominal. Consequently, the setting power of the four-channel hydraulic system is 1,5 times less than that of the three-channel version. It is possible to presume that hydraulic system mass is proportional to its setting power for the same Orbiter with the same consumers, and therefore the four-channel version of hydraulic system can be lighter. However, as against a standard airplane with main engines, in the BURAN Orbiter, landed non-powered, the pumps are induced in rotation by a Auxiliary Power Unit (APU) which uses gas turbine as an engine. As is known, the masses of such APU very little depend on the developed power (within the required range). The analysis has shown that application of the fourth APU (at a four-channel hydraulic system) would result in increase of aggregate HS and APU mass. As a result, the three-channel hydraulic system was accepted. The work on the structure of hydraulic system and drives has shown that the existing drives do not correspond to the technical specifications and operation conditions. In this connection the drives of original structure were developed and implemented in BURAN Orbiter. rudder-air brake (DR-AB) and balance flap (BF) rotary drives. Selection of the drive type was determined by the layout requirements. Drives of a translation type (see Figure) are constructed with one hydraulic ram (1) and spool valve (2), supplied from hydraulic system through switch (3) of its channels. The switch connects the operating channel of hydraulic system to the drive instead of the failed one. It provides the constancy of the developed hinge moment. The four-channel control part of the drive (4) is also supplied through switch (3). DR-AB drive of rotary type is made as an integrated unit with two channels: of rudder and air brake. 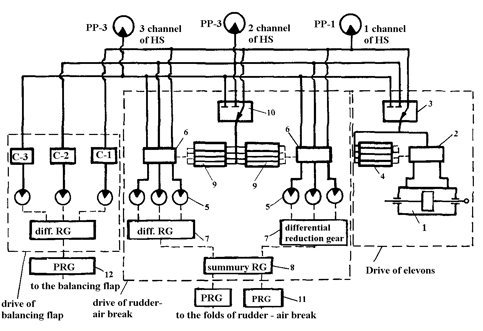 Each channel of the drive is initiated to rotation by three hydro-motors (5) connected through spool valves (6) to the channels of hydraulic system. The addition of rotation rates of hydro-motors is made on two differential reduction gearboxes (7) ensuring the constant moment on the output irrespective of the number of operating HS channels. Then the rotation is transmitted to the summing reduction gearbox (8), in which the rudder and air brake motions are added and converted into flaps motion of aerodynamic surfaces of DR-AB. From the summing reduction gearbox the motion is transmitted to the DR-AB flaps through power reduction gearboxes (11). The drives’ four-channel control parts (9) work similarly to the elevons drive and supplied through a special hydraulic system switch (10). The balance flap (BF) drive is of relay follow-up, rotary type, in its load-bearing part constructed similarly to the drive of DR-AB. The rotation from balance flap drive is transmitted to the aerodynamic surface of BF through power reduction gearbox (12). The output units of power reduction gearboxes are simultaneously mounting joints of airfoils. In order to reduce the consumption of operating fluid consumed by the drives, their output link rate is restricted for the increase rate gradient of the input signal coming from the control system. Therefore, within the whole range of small, medium and assisting loads, the drive rate is constant and starts to decrease at big loads. The rate restriction varies depending on the number of operating channels of hydraulic system. At the failure-free operation or at a failure of one channel, the rate restriction of the output link of each drive remains constant. And at two failed channels, the rate decreases to 60% (of rate at operating channels). In view of necessity of sustaining the available effort or moment on the output links of drives, the pressure drop in the channels of hydraulic system is intolerable. It can occur, when the required consumption of operating fluid in hydraulic system exceeds the available. failure of two channels of hydraulic system. The priority is implemented as follows. At failure of hydraulic system channels, the available consumption (power of hydraulic system) becomes insufficient for simultaneous operation of all drives. It is known that the operating fluid consumed by the drive is practically directly proportional to the rate of the drive motion. Therefore, at every operation stroke of CS onboard digital computer the drives required running rate, and accordingly the required consumption of operating fluid are calculated. If required consumption it exceeds the available, the control signal is sent to the drives sequentially, in the order of importance of aerodynamic controls. First, the required consumption on elevons and the difference between the available and required consumption are calculated. If the difference is positive, CS calculates the running rate of the rudder and then that of air brake and balance flap. Those drives, for which there is no available consumption, are initiated at the subsequent strokes of CS operation. At the orbital flight leg in stand-by mode of hydraulic system, OS is exposed to deep cooling. For sustaining the necessary temperature, both the thermal insulation of units and HS pipes and the warm operating fluid pumping by additional low-power pumps is applied. Heating the operating fluid is provided with special heat exchangers using the heat evolved in the instrument module. A considerable heat quantity is evolved at hydraulic system operation at descent. For heat pick up, in each channel the evaporative heat exchangers are installed. All considered engineering solutions implemented in the structure of hydraulic system and drives (application of single-chamber drives with a switch of hydraulic system channels, rate restriction of the drives, introduction of priority of drives operation and pumping operating fluid). They are of essential novelty and can find application in the development of orbital planes of the next generation. At that, in order to provide minimum energy consumption, it is expedient to proceed to independent control drives with volumetric regulation, having kept the principles used in BURAN Orbiter. Development and creation of such drives and hydraulic systems to provide their energy supply for operation conditions at extreme exposures represented a complicated technical problem. The solution of it demanded a lot of hard work from the part of large teams both of NPO MOLNIYA and other research institutes and design organizations. The main developers were: NPO MOLNIYA (Mr. Kryukov A.A., Shavel Ye.I., Skinder G.F., Pichkov V.V., Yankin I.M. ); TsAGI (Mr. Boris Yu.A); AZ Rubin (Chief Designer Mr. Zverev I.I, developers Mr. Shveikus K.M., Verle Ye.S, Sulla E.P., Kokonin S.S., Pevzner A.N., Bershansky M.I. ); MMKB Rodina (Chief Designer Mr. Selivanov M.P., developers Mr. Shapovalenko V.S., Podshivalov V.M.) and PMZ Voskhod (Chief Designer Parmenov Yu.A., developers Mr. Ambarnikov A.V., Tychkin V.I. ).